I have such a great time on Monday nights at the Dundalk Moose Lodge. They allow us stampers, scrappers and all around crafters to come and have fun, have a safe place to play, good food and great drink. 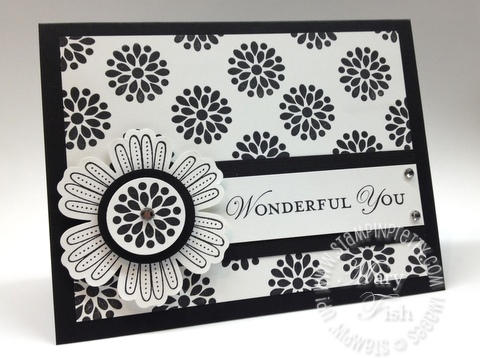 I absolutely LOVE black and white cards. I mean, if all I could do was black and white cards, I would do it. But, I have to branch out a bit and decided to use some colors I typically don't use. Here is my re-creation or in the stamping world, CASE'd it (Copy and steal everything... hahahaha). I prefer black and white... but here I used bashful blue and baja breeze;. Birthday saying is from Close to my Heart. And then... aaahhhh.... My friend Lynn Haase let me borrow her stamp saying. I've had the acrylic jars cut out and I did the little bugs with my Cricut, ohhhh... about a year ago!!! Yes..... I've had these cut out and hadn't done anything with them. Well... today on this gloomy, rainy day, I got to get in my stamp room and get movin' . 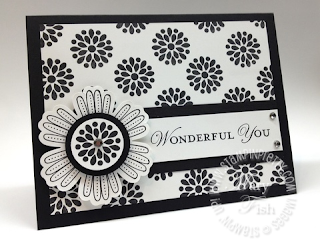 I decided if I got anything done, I had to get this card done to get Lynn her stamp back. The embossing powder I found in my embossing drawer. (I don't go in that drawer very often). But the powder is called Fireflies. (go figure!). It's black with a hint of gold glitter in it. WOOHOO!! I thought this was perfect.